In Sanskrit “Padma” means “Lotus”,”Parvat” means “Mountain”, “Asana” means “Posture”. The English name is “Lotus Mountain pose”. Spiritual Awareness : Swadisthan Chakra. Physical Awareness : Maintaining the balance and coordination with breath. Dosha Suitability : Best advisable for Vata, whereas Pita and Kapha can also benefit. Relax the whole body. Exhale, supporting the weight with the hands, slowly lean forward and raise the buttocks off the floor. Adjust the position of the hands for comfort and balance. Still using the support of the hands, stretch the trunk up vertically, standing on the knees. Balance gradually by lifting the hands from the floor one at a time. Focus the gaze on a fixed point in front to maintain balance. When balanced, bring the palms of the hands together in front of the chest in the prayer pose. Hold the final position for as long as possible without strain. Breathe normally. Slowly exhale and lower the hands and buttocks to the floor and sit in Padmasana. Release the legs, change their position and repeat the pose for the same length of time. Allows the body to be held steady completely for long periods. With the legs as the firm foundation, holds trunk and head like a piller. Directs the prana from mooldhara chakra in the perineum to sahasrara chakra in the head heightening the meditation experience. 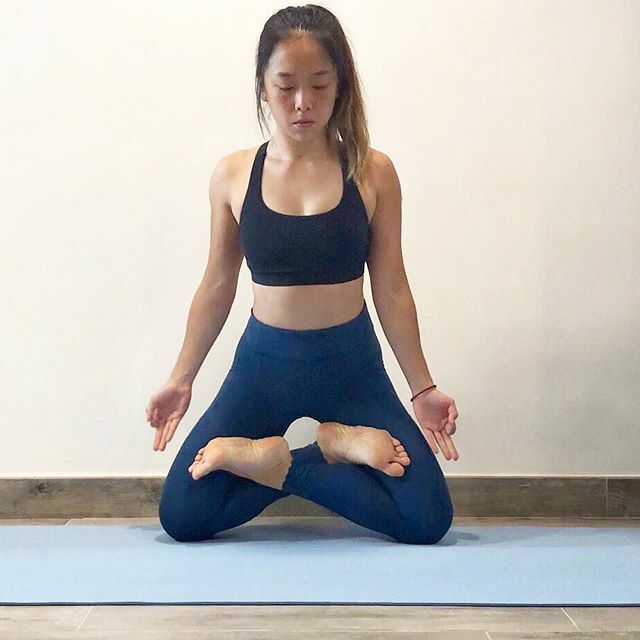 Applies pressure to the lower spine and thus relaxes the nervous system slowing the breath, decreasing the muscular tension, and reducing the blood pressure. The large blood flow to the legs is thus redirected to the abdominal region. Stimulates the pelvis, spine, abdomen, and bladder. Stretches the ankles and knees. Traditional texts say that Padmasana destroys all diseases and awakens Kundalini. Apart from the benefits of Padmasana, it helps to have improved balance and coordination. Padmasana is considered to be an intermediate to advanced pose. Do not perform this pose without sufficient prior experience or unless you have the supervision of an experienced teacher.